Long ago, icy glaciers pushed stones from far-away mountaintops into the New England soil. While fieldstone became the folklore of poets like Robert Frost, the labor of moving stones by hand was a constant burden for local farmers. Massachusetts stone craftsman, Gerald Croteau, creates spectacular stone serving plates from the stones that once burdened New England farmers. These 11" stone serving plates are sliced to about 1/2 " inch thick from boulders that were hand gathered at small working farms in New England. Each plate is unique in shape and color, comprised of stone commonly called granite, but geologically a metamorphic. The top surface is hand-polished to a glossy finish in a nine stage process and finished with a water-proof food-safe seal. The edge is also sealed. From cheese boards to fridge-chilled sushi plates, these stone serving plates are the finest farm-to-table displays of your chosen fare. Stamp on underside gives the name of the Massachusetts farm where the stone originated. Each serving plate comes with a tag that tells its story. Underside is cushioned with rubber feet. We've tested the stone plates with hot pans off the stove and from the oven and they are a great way to protect your countertop or table from heat damage. The stone plates are also fridge and freezer safe, but are not for oven use. Our stones are hand-gathered above ground from independent, working, New England farms. The raw stones from which the trays are made are gathered right from the field or from the small piles scattered about working farms, rather than dismantled from the 250,000 miles of stonewalls lining the countryside. Banquet Size Dimensions: approximately 12" diameter x 1/2" thick, weighing approximately 6 pounds. Care: These stone serving plates should be hand-washed with warm, soapy water. 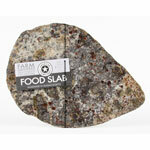 The food safe seal on the Food Slab's top surface makes it easy to clean and stain resistant. Each Farm-Gathered Stone Serving Plate is unique. The selection shown above is iillustrative of the range of shapes and patterns of the finished entree serving plates.